I decided to start off this Saturday morning as I usually do – scrolling through my business social media, responding to any queries, posting my latest cake picture and looking/being inspired by other cake designers. 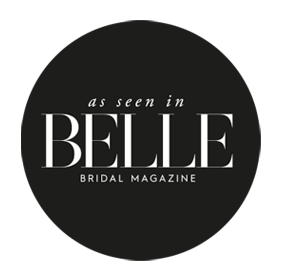 My inspiration comes from so many places but there are some designer’s work that just stands out to me. One of these is a wonderful lady called Suzanne at Cove Cake Design in Dublin. When I found out Suzanne was doing a sugar flower masterclass in the UK last year, I just knew I had to go! Sugar flowers have always been a passion of mine and something that I’ve taken pride in getting to a high standard but hers just seemed to be next level. The class was down in Oxfordshire, 4.5 hours away, it was three days, I’d have to stay in a hotel and pay for travel, food and the class itself, the whole experience was going to end up being little under £1000 but it was something I really wanted to do. Something, that was going to push me and make me better. I did the class last year and absolutely loved it! 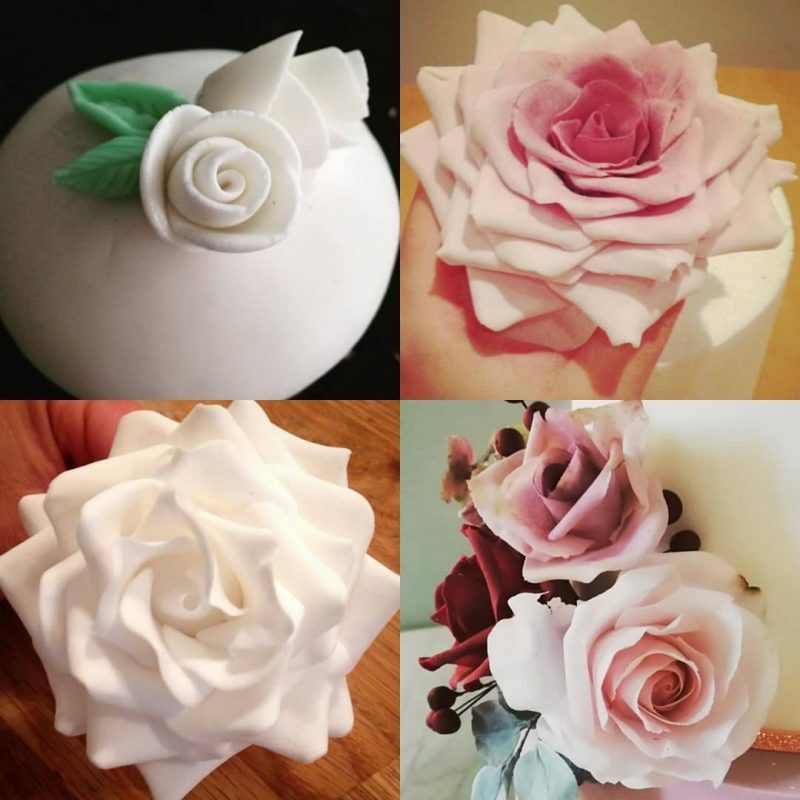 The skills I came out with have made such a huge difference to my sugar craft and clients are now coming to me because of my sugar flowers. So when Suzanne put out a second class at All Cakes and Sizes and I saw the new flowers she’d be teaching, it was a no brainer! 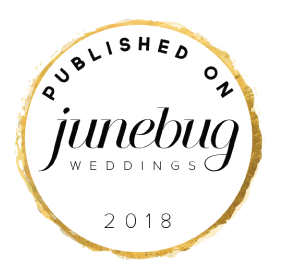 The new class featured: Chrysanthemums, Pom Pom Dahlia, O’Hara Rose, Scabiosa, blackberries, blueberries and foliage, plus we were taught how to arrange our flowers in a ‘wilder style’ to work alongside the wild style bouquets that are all the rage at the moment. 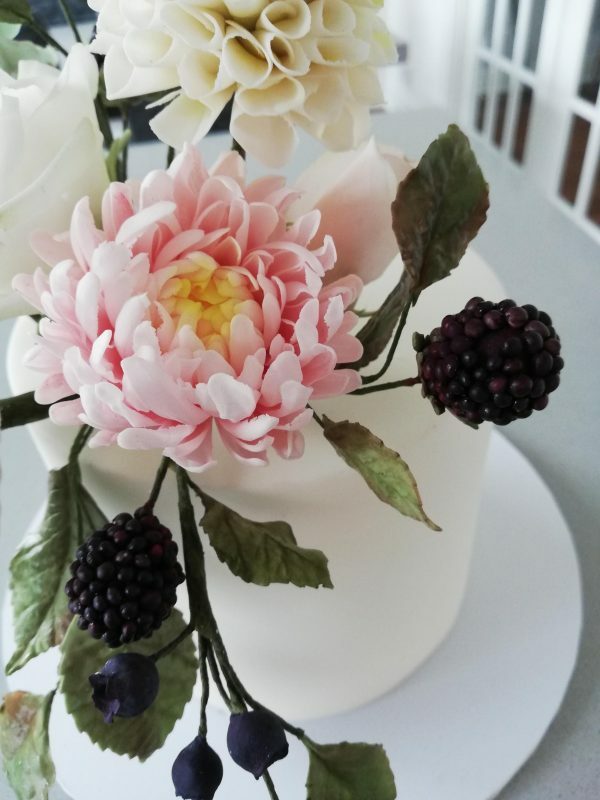 My favourites had to be the blackberries and the Chrysanthemums and I’ve invested in some new cutters and veiners to achieve the realistic look of the leaves. The class was brilliant! I met some amazing cake designers from all over the UK and learnt a lot from them also about the business side of things. Sometimes as I love what I do so much I forget that it is a business! Suzanne is a fantastic teacher and has so much patience when things don’t go right the first time. Believe it or not I can be a bit ‘cacky-handed’ and I found the Pom-Pom Dahlia a real struggle – it fell apart three times because I was too rough! But we persevered and got there in the end. That flower needs a bit more practice in my opinion but we were all there to learn – not to master. 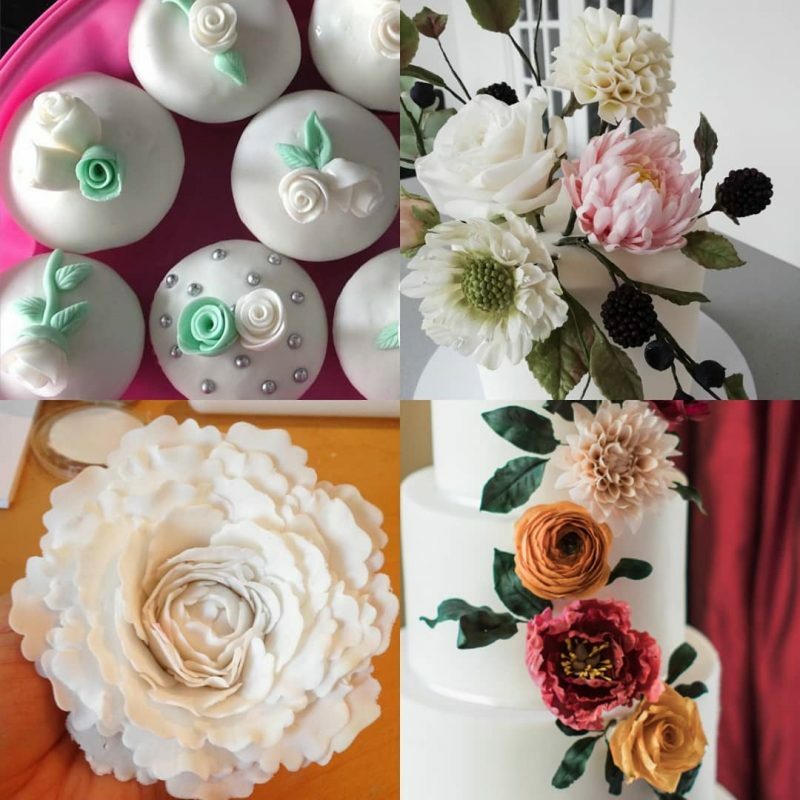 The change in my sugar flowers in the last three years is ridiculous (see progress pictures below) – I’ve practiced, I’ve been to classes and I’ve worked so hard to get to the level I am now. I will always strive for perfection and will always put 110% into any cake that I make. I guess what I’m trying to say is you are always learning and you should continue to learn, too many of us get complacent but there is so much more you can achieve if you are passionate about something and put yourself out there.